Pick up Aspect and start making your own legends. 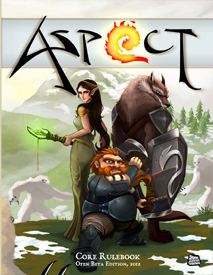 Now in it's third edition, Aspect is not your ordinary dungeon crawling, dragon slaying role playing game. Aspect focuses on freedom of character development, not linear progression. Its rich mechanics allow for sharpened words as well as sharpened blades, duels of social wit and mental cunning as well as strategic physical combat familiar to veteran gamers. Don't be a cookie-cutter character! Mix and match 40 unique power sets with nine combat roles to be as flexible or focused as you want. Choose from the 16 gentle races and their unique powers or make your own hybrids. You can even use the monster races or easily make new races from scratch. Encounters are easy to set up as Aspect handles Physical, Social and Mental combat, each using the same mechanics. A more detailed list of updates is available in the forums. Join the open beta playtest of Aspect and rekindle your enthusiasm for tabletop action-oriented fantasy adventures. Find downloads, discussion, and answers to questions on the Forums. Pick up the hardcover version on Lulu.